Back in April 2011 I was fortunate enough to be accepted into the Google Teacher Academy held in Sydney, Australia. As part of this first Australian cohort, I was so excited to be part of this amazing team of educators from around the world and we spent two days deeply immersed in all sorts of Google nerdiness mixed with teaching inspiration. It was at this event that I saw a Chromebook for the first time, played with Android for the first time, learned about a bunch of new Google tools that I wasn’t really aware of, and most importantly, met an astoundingly talented group of educators who shared brilliant ideas about pushing education forward. To say that this event had an impact on my life would be a huge understatement. Becoming a Google Certified Teacher (now know as a Google Certified Innovator) was not only highly relevant to my work at school, it also opened up opportunities to do work with EdTechTeam, travel the world presenting at Summits and workshops, and eventually lead to my current role as their Director of Professional Learning. So when I say that the Google Teacher Academy changed my life, I’m not exaggerating at all. 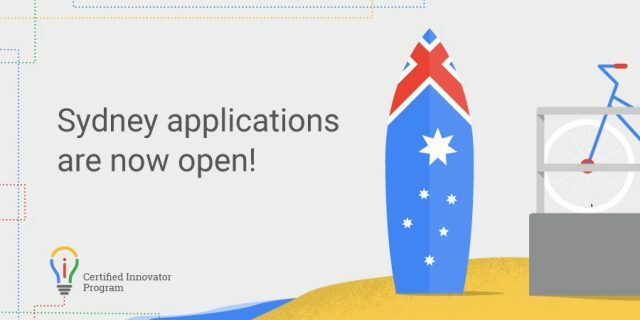 So I’m excited to let you know that the Google Innovator Academy (what was previously called the Google Teacher Academy) has just been announced again for Sydney! The program has morphed and changed over the years, becoming far less about just the tools and much more about developing moonshot thinking about some of education’s biggest challenges. The program asks you to consider ways in which you can truly impact your own educational context, to think big about it, and to work on a project to make a 10x difference. In the process, you get connected to a simply amazing group of innovative educators that can, and probably will, change your life too. If you love what you do, if you want to push education forward, if you think you can make a difference, if you want to be challenged and inspired, if you want to connect some powerful tools with some powerful pedagogy, then you should think about applying for the Google Innovator Academy. It’s an application process and there is some work to do in applying. You need to fill out an application, make a video and do some work. There are limited places. Many apply, and only some are selected. But if that’s you, trust me, it can change your life. And good luck! Be awesome! You might also realise that a full history of your search and web browsing activity is kept by your search provider. In my case, that’s Google. This search history is not kept on your own computer, but rather on the search engine’s servers. You can also visit your web history page online to review (and delete if you wish) your search history or the pages you’ve visited. But what I think is not very well known is that you can also see the full history of all the voice searches you’ve ever made using your phone. Yes, every time you pick up your phone and say “Ok Google”, then ask a question, that search is recorded. And by recorded, I mean the actual recording of your voice asking the question. Naturally you can have full access to these recordings and listen to, or delete them if you wish. Personally, I find them fascinating to go back and listen to. I recently visited my voice search history and then used Audio Hijack to record them to a file, and Audacity to tidy them up a bit. I removed the gaps, tightened them up and placed them all back to back. I was struck by not only the number of searches but the variety of what I was asking for. I remember asking most of them, and funnily enough I remember getting reasonably useful answers to most of them too. I often get told I’m a fairly curious person, and when these voice searches are all compiled in one stream like this, it becomes fairly obvious. If it’s possible to ask – and I mean literally ask – your “curiosity questions” about basic facts and get quick answers, then we really do have to rethink the nature of what we ask our students to do in schools. When “fact recall” is simply the low hanging fruit of knowledge, we can (and must) change the way we think about information and knowledge building. I’m not saying that “knowing stuff” doesn’t matter. Of course it does. And a well rounded, knowledgable person should “know stuff”. But when our ability to find a basic fact quickly becomes so simple, surely we need to think about asking better, more interesting questions. And it makes you wonder, to whom did we direct our many daily “curiosity questions” before Google came along? Imagine you could visit any place in the world. Where would you go? What would you like to see? What would you hope to experience? Imagine you are learning about India. Wouldn’t it be wonderful to visit the Taj Mahal and explore its wonders? What if your geography class is learning about coral reefs and could go diving in the Maldives or Hanauma Bay or the Great Barrier Reef to see what it’s like there. What would it be like to visit the South Pole, or Niagara Falls or the Palace of Versailles? There are so many amazing things to see and learn about in our world. While we would love to take our students on excursions to learn about the things they can’t experience at school, there are obviously many places that are simply too far away, too expensive, too dangerous or too impractical to visit. Meet Expeditions. Expeditions is a new tool in development from Google that uses the StreetView technology found in Google Maps to take students on virtual field trips to all sorts of exotic and interesting places, all without leaving the classroom. 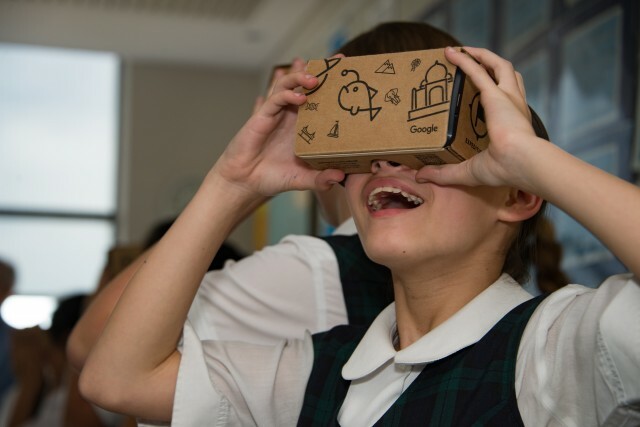 Using a simple and inexpensive viewer made of cardboard, paired with a smartphone and the free Expeditions app, teachers are able to share immersive 3-dimensional, 360-degree panoramic imagery with their students to let them experience some of the incredible places that a school bus simply cannot take them. Although Expeditions is still in the beta testing stage, students from PLC Sydney were recently invited to take part in a special sneak preview of the technology. Two members of Google’s Australian Expeditions team visited us this week and spent a day sharing some of these amazing virtual field trips with our girls. Guided by the teachers, students in Years 3, 4, 6 and 11 were taken to the top of Mount Fuji in Japan, to Amundsen’s Hut in Antarctica, climbing El Capitan in Yosemite National Park, and feeding sharks off the coast of Miami, to name just a few. The excitement, engagement and enthusiasm of the girls was very obvious. Their reaction as they first looked through the cardboard viewer was one of utter amazement. As they excitedly looked around – up, down, behind them – taking in the full panoramic experience of the location they were virtually visiting, it quickly became apparent just how much impact this technology could have in education. As one of our teachers observed, the girls got to visit and learn about places that they would not have been able to actually go to in person. And as one of our students noted, it makes you realise just how many places there are in the world to learn about. Looking at the world through a virtual viewer is obviously no replacement for the real thing, but it’s certainly a great option for immersively taking students to places that they may not otherwise get to experience for real, all without leaving the classroom. As a tool for learning, as a starting point for discussion, as a means of provoking conversation and questions, Expeditions is astonishing in its simplicity. The intent of the Expeditions team is to develop a tool that not only offers an incredibly immersive educational experience, but can be used in schools at minimal cost. Many students already own a smartphone, so by adding a free app and a viewer costing just a few dollars the potential for exploring the world virtually becomes a very real option for schools everywhere. In 2013 Google released Hummingbird, perhaps the most significant update to their search algorithm since the search engine launched. “On September 26, Google announced a new algorithm impacting more than 90 percent of searches worldwide. They called it Hummingbird. Google’s Amit Singhal later said it was perhaps the largest change to the algorithm since he joined the company back in 2001. In plain English, this means that the conventional wisdom of the way we teach search – identifying important keywords, eliminating unnecessary terms, removing the conversational parts of a question, etc, is no longer quite as critical as it once was. I’ve heard many teachers tell students “never just type in a question to Google in plain English” but that’s exactly what Hummingbird is designed for. With so many searches now being done via mobile devices using voice, the evolution to plain language questions and semantic queries is the next evolution in Google search. As a demonstration, here are 50 questions, all done using voice search, to show you just how powerful this new algorithm really is. Of course, these are mostly simple fact recall style questions, and more sophisticated queries will still benefit from a more sophisticated approach to writing search queries – using good search terms, excluding words or phrases, using search operators like site:, filetype:, etc, as well as making the most of extras like colour filters, date ranges, and so on. But if you’re still telling students not to write plain language queries because that the advice you’ve you’ve always given them, maybe it’s time to update your advice? And of course, it highlights why the things we ask students to do these days need to be based on far more than simple fact recall. With most students now carrying around Google in their pockets, the value of “facts” has been completely commoditised. We need to focus on helping them develop knowledge and wisdom, not just facts. Facts are cheap. 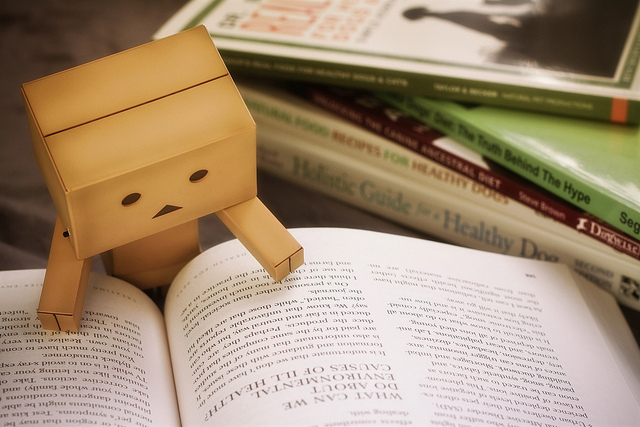 Our school has a subscription to a website called the Study Skills Handbook which offers study tips to senior students. I’m sure it’s a valuable resource; so valuable in fact that it’s behind a $1200/year paywall that requires a login password in order to access it. What a bargain. I’m sure those tips wouldn’t be found anywhere else on the Internet for free at all. You could also ask your local librarian for any additional direction on where to look for resource material for your assignment. Librarians are often your best source of information. They know how to help people access relevant and appropriate information, in books, the Internet or computer based references. One of the challenging aspects of Internet based searches for school students is the complexity, language and purpose of websites, not to mention bias and reliability. It’s true that the Internet can be a wild and woolly place to find information, with the potential for complexity, bias and reliability concerns. However, it is also the environment that most resembles real life, where complexity, bias and reliability concerns are just part of the way the world actually works. While it would be nice to think that the real world could be packaged up into nice neat little packages, decoding the messiness of real life and sorting through all that stuff is one of the real skills our students need. That said, here are a few suggestions that students can do when they are given a research task on any topic . Of course, the suitability of each of these suggestions will depend on the topic being researched. 1. Start with the Wikipedia article. For whatever potential concerns that people might have about the public edit-ability of Wikipedia, the fact is that for the VAST majority of topics it will be the most current, most accurate and most well researched summary of the topic. Start there. 2. Having read the Wikipedia article on the topic, scroll all the way to the bottom of the page and look at the citations list. One of the requirements of Wikipedia articles is that they include a citation for every statement made, and any uncited statements are challenged and eventually removed. So for many topics, looking at the citation list (and links) will provide a treasure trove of further research ideas. 3. Go to Google Scholar at scholar.google.com and search for your topic there. These articles are all reviewed academic papers and usually provide excellent reading on most topics. Not only that, but each article in Scholar shows a link to the downstream papers that cited them, which again provides further reading. If an article has dozens, or hundreds of papers citing it as a source, then you can assume that other researchers have found them valuable. Your students probably will too. 4. Set up a bookmarking system that allows you to keep a collection of relevant links in one place. I HIGHLY recommend Diigo, not just because it is by far the best online bookmarking service around, but it also allows group collaboration on shared bookmarks and online markup of webpages. Using Diigo, a student can make comments and leave sticky notes directly ON a webpage, share those annotations with their partners, keep an organised list of relevant research articles and much more. Diigo is probably the number one tool that students should be using with web research, yet I wonder how many of them actually even know about it? 5: While in Diigo, do a search for the obvious tags related to your topic that are being used by others. This will reveal another rich resource of ideas on a topic by connecting with links and sources that other people have already found useful. It’s often a much better way to narrow in on relevant study resources than a regular Internet search because it has already been through a kind of social approval process. As more people tag a resource it gains social credibility and value, making it more likely to be the kind of resource that others will find valuable. 6. Set up some kind of tool that allows them to curate content. I recommend Flipboard, but there are many others like Zite, ScoopIt or even Pinterest. By curating relevant content into one place it builds a go-to resource for more reading on a topic. Curation like this should be a key digital information strategy. 7. Then there is the use of Internet search in general, such as Google or Bing. But too often students take a very limited approach to search because they simply don’t know any better. As well as using a rich array of search strategies and search operators (there is way more to it than just typing a couple of words into Google!) there is also Book Search, Map search, Image search, etc, each with their own nuances and advantages. While these various search tools and techniques won’t be applicable to every topic and subject, many will. Our students need to be taught about them so they know when is appropriate to use them. 8. Finally, particularly if you;re researching something that is fairly current or topical, go to Google Alerts and set up an alert for anytime that topic is mentioned online. You can be as specific or general as you like in your search terms, but whenever a new result matches that query it can send you an email to let you know about it. So there are a few ideas for helping your students deal with those “Other Resources” that might be out there on the big scary Internet. There’s a LOT more that could be included in there, but this is a start. Maybe some of these ideas and tools are new to you, so you might like to take a look at them yourself in order to be best able to assist your students navigate this information rich, and often overwhelming, world of information they live in. And none of that information I just shared was behind a paywall. You’re welcome.